The Educational Insights Nancy B’s Science Club Binoculars and Wildlife Activity Journal is designed to give your child a hands-on science experience, helping them to not only be comfortable with science, but to have fun with it and be excited. The binoculars have a compass, 4x magnification, 30mm optics and a handy breakaway strap. Nobody knows science like Nancy B! Her line of scientific tools and real-life journaling activities provide hands-on science experiences that get kids comfortable and excited about science, giving them the confidence to pursue science further in school and in life. Nancy B. is a former science teacher and mother of two who always wanted a microscope as a girl. So, she decided to invent her own line of cool science tools for kids to bring the mysteries of science to life for them. It was important to Nancy to provide robust journals with all of her science tools so kids can learn about the world around them and at the same time document and share their own findings. So, how about a GIVEAWAY? 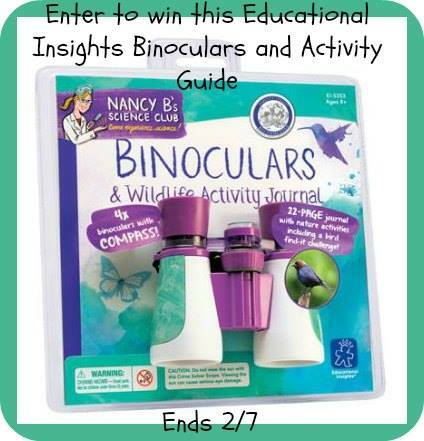 That’s right, the fabulous folks at Educational Insights offered one lucky reader a Nancy B’s Science Club Binoculars and Activity Journal of their own! Educational toys are important in helping children to be creative and learn as they have fun. Anything that helps kids learn even before going to school is a big help. Everything is so much farther advanced now. Educational toys are important to broaden children’s minds in a fun and enlightened way. Educational Toys are beneficial to kids because they teach them new things they need to know & they are fun. I like when they are having so much fun they don’t even realize that they are learning. These binoculars would get them interested in wildlife too! Because if kids are having fun, it makes it so much easier to sneak in some learnin’ on ’em! lol but seriously! I think education is important! If children can learn in the form of having fun it’s a win win situation. I think kids learn more when they are having fun. Toys that teach making learning easier and more fun! I think they are important cause they help kids learn early. Kids are able to learn in a very hands-on way about the world around them. I love using play to reinforce learning concepts. Kids love to learn. kids will play anyway… you may as well encourage them to learn , and they wont even know it. learning doesnt need to be work. it can be incredibly fun! I think they are important because they make kids want to learn and enjoy learning which is something that they will hopefully take with them in the future. Teaches the children to learn while they play – 2in1!! I think Educational Toys are great, they take the pressure off kids thinking they have to learn something, and they end up learning while having fun! So they can experience the world, extermination, learn new things, be hands on. Educational toys are wonderful because they fuel a lifelong enthusiasm for learning. They are important because they help make an interest in learning! Toys that are fun, but that also help children to learn, are awesome! I love Educational Insight toys!